The month of August — like, basically, every month for the past 10 years — has not been kind to the music industry. Between August 8th and 14th, only 4.95 million albums were sold, the lowest weekly level since Neilsen Soundscan starting tracking sales in 1991. This past week, sales were up, but just barely: just over 5 million albums were sold, an increase of only 2 percent from the record low. 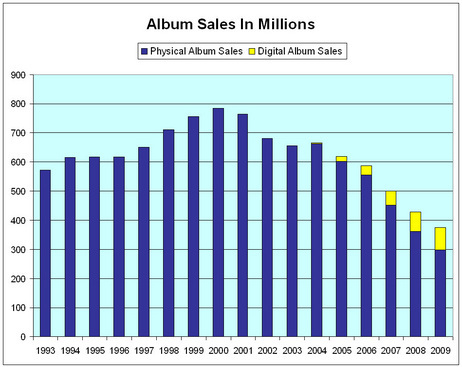 As you can see from the chart below, album sales have been on a steady decline since their peak in 2000. Digital album sales are growing, but not fast enough to make up the decline in sales of CDs. Music industry execs blame the dropping sales numbers on illegal downloads. Musicians should be happy with poor music lovers reallocating music wealth.. This entry was posted on August 28, 2010 at 8:28 am and is filed under Uncategorized. You can follow any responses to this entry through the RSS 2.0 feed. You can leave a response, or trackback from your own site.